The weather – observed and predicted – now looks like a normal summer pattern in the Northeast Pacific Ocean. Finally! Amazingly, after sailing for 1600-2100 nautical miles and through a series of complex weather systems and transitions, the fleet are all on very similar final approach lines. That in itself is a bit unusual. A more normal situation would be for boats to be converging into the finish from a wider range of laylines and optimal gybe angles. So, it’s a lot simpler now, right? In one word, yes! The longer answer is that the boats are each on their own line to the Pailolo Channel which separates Maui and Molokai. That line was pretty much determined for each boat by how and where they managed to navigate through the low wind area associated with the ridge/plateau that extended East of the High, and into the actual Trade Winds. The lines are more similar than different. 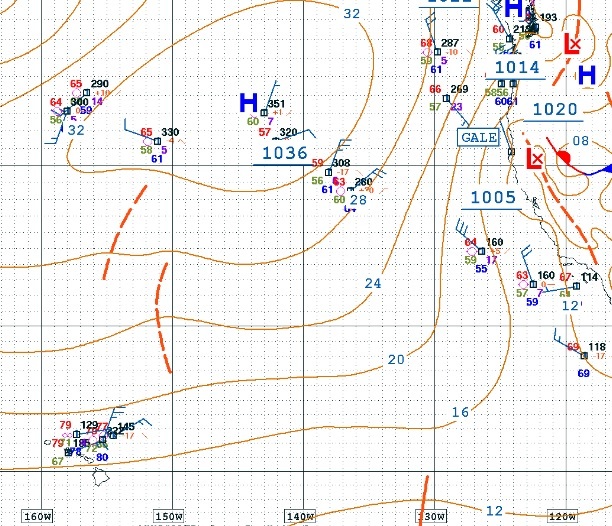 At the macro level, the expected conditions from here to the finish are Trade Winds blowing from 075-090 degrees True at 13 – 18 knots of True Wind Speed, sustained, with higher speeds in gusts or squalls. Now, it is a simpler mode of optimum boat speed in the desired direction. This is known as Velocity Made Good on Course – VMC, rather than Velocity Made Good – VMG which is relative to the wind. For boats that are inside their own optimum laylines to the Finish, gybing with squalls or changes in wind direction or speed will help optimize VMC. As the boats are all on a similar approach line, and the macro weather picture is stable, it looks like the last stretch will be a raw speed drag race. July 12, 0900 HST – a drag race in the Trade Winds to the Finish! But, there's always a few more things to think about … the islands of Maui and Molokini, and the Pailolo Channel between them, bend and funnel the Trade Winds. 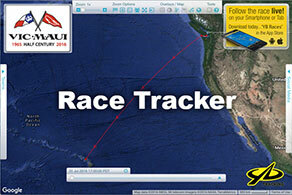 Plus, the Finish line is near the leeward side of the island of Maui. To finish well, the boats should be paying close attention to how they get in the channel and across the Finish line. One eye on the weather! Caveat: this article and images are presented for informational purposes – they are not predictions of or advice to any boat regarding weather or routing!